Are you interested in multiprofessional work and collaboration in the interfaces between the fields of art and social work? Do you wish to have new tools to develop multiprofessional approach? Handbook for Moving towards Multiprofessional Work offers theoretical background and tools for multiprofessional training, for starting multiprofessional collaboration, and for planning and implementing multiprofessional projects. The handbook was developed to provide a resource for educators and professionals who aim to build bridges between the fields of art and social work. Lecturers across the areas of arts and social work can use the materials presented in the handbook to enrich their courses and to explore how multiprofessional work can improve outcomes for those who are in the receipt of their services in more imaginative and creative ways. Handbook for Moving towards Multiprofessional Work intends to suggest and inspire towards multiprofessional work. It offers training packages – the first of which is for arts and social work professionals and teachers and the second for students – to be adapted depending on contexts, and a range of illustrative case examples of multiprofessional work in different countries. 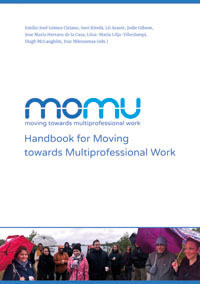 The handbook is drawn up within the international Erasmus+ KA2 project ”MOMU – Moving towards Multiprofessional Work”. The project developed multiprofessional higher education between the fields of arts and social services in collaboration between higher education teachers, students and working life professionals in the UK, Estonia, Finland and Spain. The activities aimed at increasing cooperation between the current and future professionals working in the fields of arts and culture and social work as well as creating a new kind of understanding. This handbook is a starting point that paves the way for future collaborations that help preventing youth unemployment and social exclusion in Europe. Click on the green "Lataa E-julkaisu" button to load the e-book for free. This copyrighted material can be downloaded and printed for private use. Commercial use prohibited.